NETWORK FINALS: SUNDAY NIGHT FOOTBALL adjusted to 9.1, up 0.7 from the final number for the 2016 premiere game. 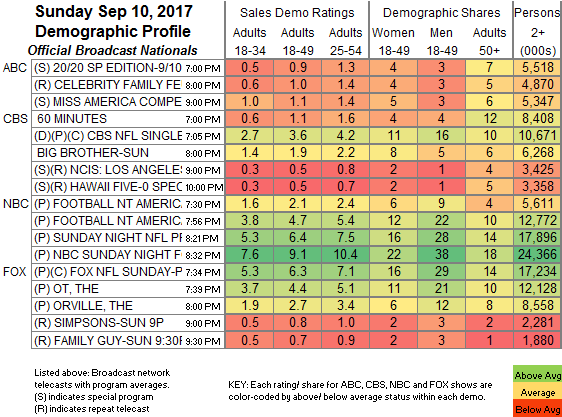 THE ORVILLE’s premiere adjusted up 0.4 to 2.7, but there’s an asterisk because Nielsen counted two plays on the west coast, one simulcast with the east after football, and the other at 8PM Pacific time. On ABC, both the 20/20 special and the MISS AMERICA PAGEANT lost 0.1 in final numbers. The rerun of THE SIMPSONS dropped 0.2, and the reruns of FAMILY GUY and NCIS: LA were down 0.1. CABLE HIGHLIGHTS: It was a busy night for cable, although none of the newcomers were at the top of the chart. On HBO, THE DEUCE premiered at 0.24, below the 0.31 for the premiere of BIG LITTLE LIES, which like THE DEUCE was available in advance via VOD and streaming; BIG LITTLE LIES more than doubled to 0.66 by its finale, and we’ll see if THE DEUCE has those kind of legs. Lead-out BALLERS ticked down to 0.41, the season finale of INSECURE ticked up to 0.40, and LAST WEEK TONIGHT returned at 0.36. On Starz, OUTLANDER premiered its 3rd season at 0.31, down 0.08 from the 2016 premiere (on a Saturday), and SURVIVOR’S REMORSE plunged without its POWER lead-in, down 0.19 to 0.14. FEAR THE WALKING DEAD returned to AMC with 2 hours at 0.78, considerably down from the 1.18/1.04 for the 2-hour season premiere in June, and even down from July’s 0.93/0.83 midseason finale ratings. Notably, a 1-hour preview of the next season of THE WALKING DEAD was almost as strong as FEAR at 0.68. Lead-out TALKING DEAD was at 0.21. The premiere of Sundance’s TOP OF THE LAKE: CHINA GIRL was off the chart at 0.06/346K. With the seasons over for GAME OF THRONES and POWER, the strongest show on Sunday cable was clearly RICK & MORTY, the #1 show of the night at 1.32, which was down only 0.05 from its last airing 2 weeks ago, with lead-out TIM & ERIC’S BEDTIME STORIES at 0.58/0.46. On Showtime, RAY DONOVAN returned from its week off for the TWIN PEAKS finale, down 0.03 to 0.20, while EPISODES was steady at 0.04/264K, and DICE was up 0.01 to 0.04/183K. FX’s THE STRAIN dropped 0.04 to 0.34. TNT’s THE LAST SHIP fell 0.07 to 0.27. Hallmark’s CHESAPEAKE SHORES ticked up to 0.24. MTV’s TEEN WOLF ticked down to 0.21, and a lead-out special was at 0.10. Unscripted continued to be dominated by Weather Channel’s WEATHER CENTER LIVE, which had all 14 slots below RICK & MORTY, led by the 10AM hour at 1.22. 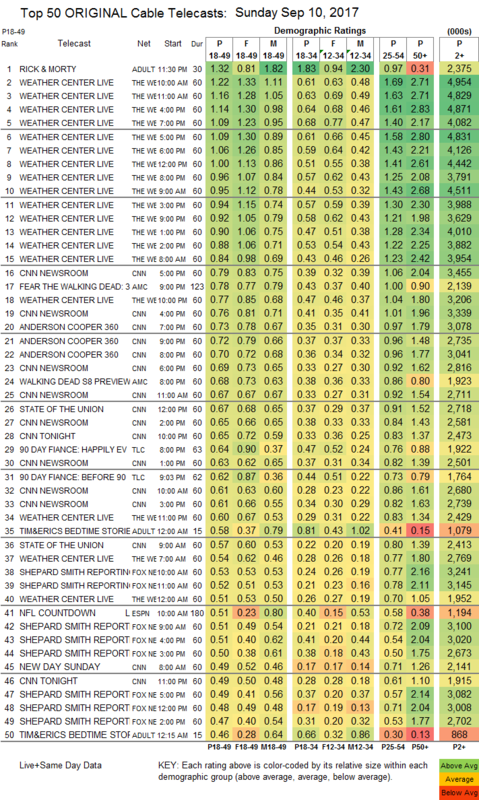 On TLC, the season finale of 90 DAY FIANCE was at 0.64/0.62, compared to last week’s 0.60/0.57, and the season finale of SPOUSE HOUSE was down 0.03 to 0.24. Bravo’s SHAHS OF SUNSET was at 0.42. Food Network’s GREAT FOOD TRUCK RACE was steady at 0.33, and GUY’S GROCERY GAMES was also steady at 0.30. HGTV’s line-up was led by BEACHFRONT BARGAIN HUNT at 0.28/0.26, compared to last week’s 0.25/0.24. On E!, LIFE OF KYLIE ticked down to 0.26, WAGS gained 0.02 to 0.15, and E!’S LOOK BACK was at 0.13. ID’s AMERICAN MONSTER fell 0.07 to 0.24, and DEADLINE CRIME was down 0.05 to 0.24. Spike’s BAR RESCUE ticked up to 0.23.